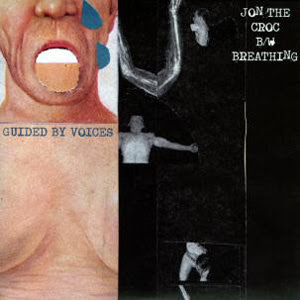 This was the second of three 7'' singles released off the 2nd GBV reunion LP Class Clown Spots a UFO. It contains 1 exclusive b-side. Limited to 1000 copies on turquoise vinyl. Released in the UK on Fire Records. Jon the Croc- Same song as reviewed under the LP Class Clown Spots a UFO. Read review there. Breathing: 3 Tobin Sprout penned b-side. Plodding along, hooky nugget that rarely shines considering Sprout's so easily capable of doing in the GBV cannon. No fantastic hook, and it has some warped sounding production. Where Sprout generally paints a colorful, emotional canvas, this particular endeavor remains rather gray. I generally agree with your review of Sprout's songs, but I absolutely love this one, something about the insistent rhythm and the way it contrasts with Sprout's nonchalant vocal delivery just makes it irresistible to me. Probably my favorite b-side from the reunion albums. Yeah I'm not even a big fan of Tobin's songs but that's clearly one of his best.